Whyteleafe FC committee member and motoring journalist, Steve Hole, gets the Earl Grey out for his weekly round-up with Leafe boss, Harry Hudson. Harry talks about last Saturday’s defeat away to Hastings (with amazing and refreshing honesty, as ever) and this week’s upcoming home game when Leafe host Phoenix Athletic – Church Road, 3pm. 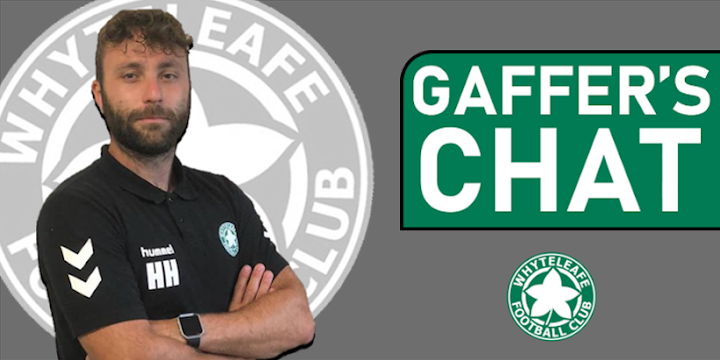 So, without further ado, here’s more from the gaffer as he brings us his thoughts and important team news, the ins, the outs, and the highs and lows. By the way, we’re not having Earl Grey again. Tastes like Fairy Liquid! Harry, whichever way we dress that one up, Saturday’s performance wasn’t pretty. Just a bad day at the office or did Hastings set a trap for us? After all, they must have been smarting after we’d beaten them twice already this season. How did you see it? Yes, certainly a bad performance from our point of view and full credit to Hastings who were very good on the day. I also did not set us up in the right way and take responsibility for the tactical game plan which did not work. Our players were committed and applied themselves but we couldn’t gain a foothold in the game and Hastings secured territory and control of the match. I guess as a football manager, wins speak for themselves, it’s the defeats where you have to use your skill and acumen? Yes, certainly this is when we earn our money! This was always going to be a tough run and we had pre-set a points target which is still a possibility from the Phoenix and Cray Wanderers matches. We have to pull together as a group and go again Saturday. We have a fantastic group of people and I am confident we will bounce back. The fixtures come thick and fast now – and most of them are tough ones. Take this Saturday’s game at home to Phoenix. They’ve dropped out of the play-offs of late but they too are a dangerous team. What are your thoughts on this one? Definitely, they are a dangerous team who have picked up four points form their last two games - against Horsham and Hastings which is not easy. They have very good attacking players and will threaten us. The boys are buzzing to get back to Church Road after two long and difficult away trips and we hope to put right the last two results. Two more new signings this week, Harry? Tell us about striker, Andre McCollin, please? Andre is an experienced, proven goal-scorer who has played all of his career at Bostik Premier level, and above, so he is a big coup for us to secure. It was a difficult debut for him on Saturday due to the dynamics of the match but we will see Andre’s quality in the coming weeks, I have no doubts. What about Laurent Mendy? Wasn’t he formerly at Greenwich Borough. I think he came on as a sub when we beat them recently? Yes, Laurent was recovering from an injury. Mendy is a very talented player who can be unpredictable and open up a defence. We have him on a short-term deal, which will be reviewed next week. Another random football question this week, as usual. A fan has asked me to ask you – is there a feeling of frustration sometimes when you are standing in your technical area? It must be hard sometimes to get your message across to a player? The feeling of frustration is one that I am sure all managers feel at all levels of football. Managers and coaches always want to feel they can impact the game with immediate instruction but I have learnt that is very rarely the case. The information and preparation should all be done prior to match day and really frustrations in the moment do not help and can spread negativity to the group. That is much easier said than done of course and I have been known to take frustration out on my water bottle! Last question this week, you know the score. Can you update us on injuries, please? Ashley and Dan Hogan are getting minutes under dual signed agreements and Chinny missed Hastings with illness but he should be back this week.